Data Disclose can help you shine a light on the dark dusty corners of your SAP systems so you can see exactly where sensitive data resides. The application finds, retrieves and presents a subject's data footprint across SAP systems – and as an added benefit, across non-SAP systems as well, if integrated with the former's API. It does this in seconds across SAP ERP, CRM, SRM, BW and any other ABAP stack systems. Data Disclose is built on a solid foundation of existing technology and Intellectual Property (IP) by leveraging our well-established software products. Because people have the right to ask for details about their data, organisations need to know which personal data is stored where, and for what purpose. This can be hugely time-consuming; the ability to find this data quickly and efficiently becomes crucial. Enter key data fields such as last name, city etc. for that data subject in each system. The report can be tailored to explain the functions of each system, then a PDF output created. to disclose to the individual what information your company currently has in the landscape. Data Disclose can bring considerable peace of mind, especially when weighed-up against the stringent requirements of the new laws. 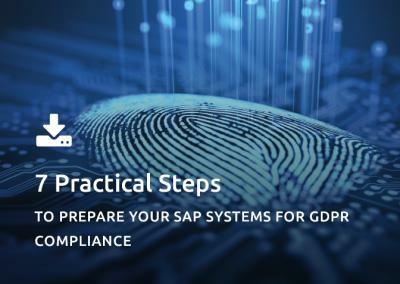 For more information, please schedule a discovery session, watch our on-demand GDPR webinars or read our GDPR FAQs. Two other new EPI-USE Labs products, Data Redact and Data Retain, can help you with an individual's rights to have personal data erased, and our XML Object Extractor can ensure the right to portability (Article 20 of the GDPR). Data Disclose is a unique software application which allows you to locate and display data across your SAP systems in seconds, with APIs to also connect non-SAP systems. It’s built on a solid foundation of existing technology and Intellectual Property (IP) by leveraging our well-established software product Data Secure (part of the Data Sync Manager (DSM) suite), and can present the data in a flexible, encrypted company-branded PDF output. With Data Disclose, we can help you shine a light on the dark dusty corners of your SAP system so you can see exactly where the data resides across systems. The application finds, retrieves and presents a subject’s data footprint across SAP systems – and as an added benefit, across non-SAP systems as well, if integrated with the former’s API. It does this in seconds across SAP ERP, CRM, SRM, BW and any other ABAP stack systems. This is no mean achievement, when you consider that SAP systems store data in an intricate way; SAP is highly configurable, with data replicated across the system in many different places. Two other EPI-USE Labs products, Data Redact and Data Retain, can help you with an individual’s rights to have personal data erased, and our XML Object Extractor can ensure the right to portability (article 20 of the GDPR).